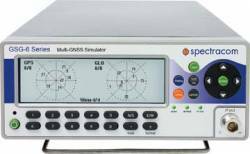 Spectracom has announced its new 16-channel GPS constellation simulator, the Pendulum GSG-55. The latest in the Pendulum line of GPS receiver test instruments, the GSG-55 is able to simulate Satellite-Based Augmentation Systems (SBAS), such as the U.S. Wide Area Augmentation System and the European Geostationary Navigation Overlay Service (EGNOS). The 16-channel unit can also simulate as well as white noise, making it possible to test receiver sensitivity under different signal-to-noise ratios, according to the company. A member of the Bromma, Sweden–based Orolia Group, Spectracom says the GSG-55 will be available in March 2011.